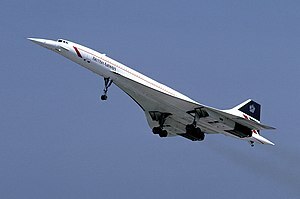 Aérospatiale/BAC Concorde is a Breetish-French turbojet-pouered supersonic passenger jet airliner that wis operatit till 2003. It haed a maximum speed ower twace the speed o soond at Mach 2.04 (1,354 mph or 2,180 km/h at cruise altitude), wi seatin for 92 tae 128 passengers. ↑ Lawless, Jill. "Final Concorde flight lands at Heathrow". Associated Press, 26 October 2003. ↑ Towey 2007, p. 359. ↑ "Ageing luxury jet". BBC News, 25 July 2000. 25 July 2000. ↑ Marston, Paul (16 August 2000). "Is this the end of the Concorde dream?". London: The Daily Telegraph, 16 August 2000.